This Disney Sweepstakes is your chance to share the Magic of Storytelling with your child and a child in need. Enter at MagicOfStoryTelling.com and you could win a library of hundreds of books for your child’s school and dozens of books for your own personal library at home. One Grand Prize Winner will receive 30 Disney-branded books for their own personal home library 400 Disney-branded books for their child’s school. Five First Prizes will each get a Frozen Pop-Up Book. Plus, for each Entry received during the Entry Period, Disney will donate one book to the non-profit organization, First Book that provides new books, learning materials and other essentials to children in need. First, you must be a registered Disney.com member to enter. Second, you must visit magicofstorytelling.com and look for the “Enter” button to enter the Sweepstakes. As a Member of Disney.com, you may enter by logging into the Website with your user name or email address and password. You can enter the Sweepstakes by following the instructions on the Website. You will need to check a box agreeing to the Official Rules and then hit the “Enter” button to complete your entry into the Sweepstakes. will be automatically sent back to the entry page on the Website, where you will need to check a box agreeing to these Rules and then hit the “Enter” button to complete your Entry. 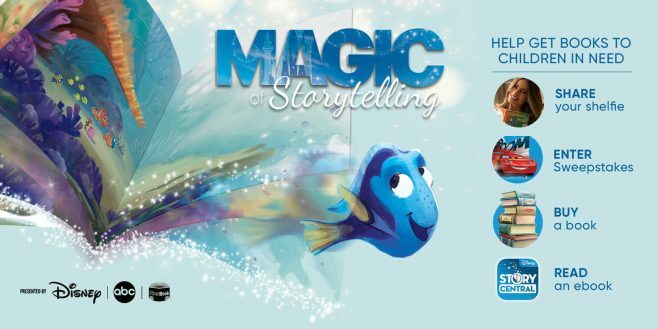 The Disney Magic Of Storytelling Sweepstakes is open to persons who are 13 years of age or older, who are legal residents of, and physically located within, the 50 United States, or District of Columbia. If you are a minor, as defined by your state of legal residence, please get your parent’s or legal guardian’s permission to enter this Sweepstakes. You may enter this Disney Sweepstakes via the internet during the period beginning at 12:00 AM PST, January 4, 2017 and ending at 11:59 PM PST, February 4, 2017. Entries are limited to one Entry per Member per day for each day during the Entry Period. On or about February 7, 2017, in a random drawing conducted by the Administrator and the potential Winners will be selected from among all eligible Entries received. Total approximate retail value of all Prizes is up to $4,725. Sponsored by Disney Online, 1200 Grand Central Avenue, Glendale, CA, 91201. Administrated by Ventura Associates International LLC, 60 East 42nd Street, New York, NY 10165. For complete details, including Official Rules, visit www.magicofstorytelling.com.